José Antonio Rodríguez Fuster is a world-renowned ceramist, draftsman, painter and printmaker whose home and studio draw a steady stream of tour buses and private visitors coming to marvel at the extravagant ceramic sculptures that adorn his home and the surrounding neighborhood—colloquially called ‘Fusterlandia.’ Fuster has made a major contribution during almost two decades of work to enliven the humble fishing village of Jaimanitas, on the western outskirts of Havana. 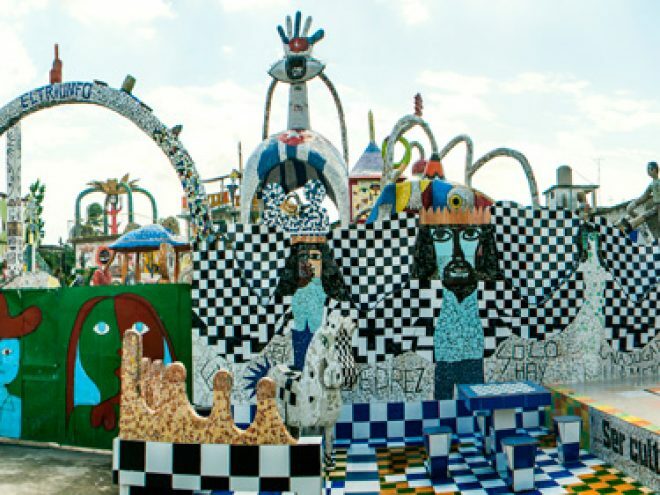 He has decorated over 80 buildings with murals, paintings, sculptures, etc. The Plaza de la Revolución (until 1959, called Plaza Cívica) is Cuba’s political center. The awesome Memorial y Museo a José Martí constructed during the 1950s is the centrepiece of the square. At the top of the tower is a mirador (reached by elevator), which is the highest viewing point in Havana, allowing visitors an unrivalled panorama of the city. Attracting as much attention as Martí’s memorial is the bronze silhouette of Ernesto ‘Che’ Guevara on the façade of the offices of the Ministry of the Interior on the north-west side of the square. The Museo Nacional de Bellas Artes is a world-class cultural center. Its collections are housed in two separate buildings—one is a very satisfactory modernist edifice (Palacio de Bellas Artes, 1954,) containing Cuban painting and sculpture, whilst the International Collection is housed in the jaw-dropping former Centro Asturiano. With nearly 50,000 pieces, this is Cuba’s most comprehensive art museum. From the late 17th century, cannon blasts were fired “at sunrise and sunset” to announce the opening or closing of the bay and the city gates. In 1898, it was decided to fire only one shot at 9:00 pm. With the restoration of La Cabaña in the late 20th century, the firing of the cannon became a ceremony, albeit somewhat eclectic given that the soldiers are garbed in 18th-century military garb but whose commands belong to the 19th-century Spanish Infantry Regulations. As always, opinion is divided–some people regard the ceremony as a continuity of a longstanding tradition, while others describe it as the apotheosis of kitsch. The 16th-century Plaza Vieja was the last and the largest of the four main colonial plazas to be laid out. Almost completely restored during the past decade, it is today an absolutely beautiful art-filled space. Many of the restored buildings now house fashion boutiques, small museums, photo galleries, cafés, and even a popular brewpub—Factoria Plaza Vieja, on the southwest corner. This brewpub has been phenomenally successful and is now something of Ground Zero in the search for a comfortable place to sit, eat, and drink in Havana’s busiest square, the gorgeous Plaza Vieja. Passengers of the popular lanchita de Regla might be unaware of the fact that sailing and rowboats were being used right from the nineteenth century to connect today’s Avenida del Puerto to Regla and Casablanca. But the lanchita de Regla is no mere pleasure craft. Hundreds of people living in Regla and Casablanca use it on a daily basis to get to work and then to return home. On weekends the ferry has a whole different aspect. Passengers seem to enjoy looking at the waters and the splendid view of Havana receding into the distance as the imposing Christ of Casablanca gets closer. Finca Vigía was the magical place that the Bronze God of American Literature, Ernest Hemingway, discovered for writing. After his suicide in Idaho, his fourth wife, Mary Welsh, donated the house with most of their belongings to the Cuban Government. Since then, Finca Vigía has been a museum, which houses more than 9,000 books, magazines and booklets, as well as personal items, such as his Underwood typewriter, hunting trophies, the “I never write letters” rubber stamp on his secretary’s desk, or the Glenn Miller record he left on the record player. The exquisite Cathedral of Havana, which serves as the seat of the Roman Cathloic Archdiocese in Cuba, dominates Plaza de la Catedral, perhaps Cuba’s most intimate square and definitely one of Old Havana’s most beautiful spots. In addition to the cathedral, which gives the square its definitive appearance, the other three sides are taken up by the façades of 18th-century aristocratic baroque mansions, all built within a 40-year period and showing a defining architectural harmony. The Malecón begins in Old Havana. The sea front drive is lined with 18th- and 19th-century stately homes, followed by a row of 20th-century buildings. But beyond the architectural values of the buildings, its greatest charm lies in being somewhere to stroll or hang out on a stiflingly hot day. It is a place where casting a fishing line may be more important than actually catching a fish; where the breeze joins nostalgic old couples and young lovers. It is Havana’s outdoor lounge. Barely a 30-minute jaunt by car from Old Havana, the sugary white sands and crystalline turquoise waters at Playas del Este more than hold their own against those at the slicked-up resorts elsewhere in Cuba. Come here in the winter and the place often has a timeworn and slightly abandoned air. At other times of year, for those who dislike modern tourist development or are keen to see how the Cubans get out and enjoy themselves at weekends, Playas del Este is a breath of fresh air.